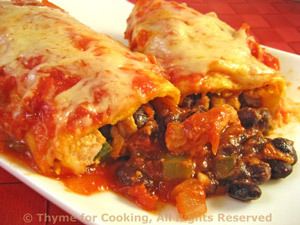 Turkey and Black Bean Enchiladas, Thyme for Cooking easy one dish dinner. Drain the chilies and roughly chop if whole. Open, drain and rinse black beans. Heat 2 tsp oil in medium nonstick skillet. Add chili powder, onion, garlic and pepper. Sauté until onion is tender and translucent, about 5 minutes. Add black beans, oregano and enough taco sauce to bind it together. Cook over low heat, uncovered, 5 minutes. Spoon one fourth of the turkey / bean mixture onto the tortilla and roll up. Place seam side down in the oiled baking dish. Pour taco sauce over the top - how much depends on your taste. I use some now and the rest as additional sauce at the table.